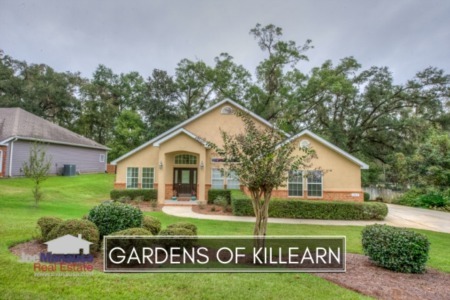 The Gardens of Killearn is a popular Northeast Tallahassee neighborhood nestled in the southern section of Killearn Estates. Homes there where mostly built in the 1990s, and the average home is 3 or 4 bedrooms with about 2,400 square feet of living space. Our company worked with several builders back in the mid 90s and helped sell a lot of these homes when they were brand new. It is interesting to watch them resell now, years later. Like much of the rest of the Tallahassee housing market though, values continue to fall in the Gardens of Killearn. 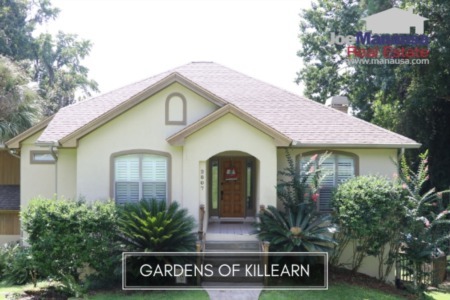 According to home sales recorded in the Tallahassee MLS, the average sales price for a home in the Gardens of Killearn has dropped to just under $255,000, after reaching a high of over $330,000 at the peak of the housing market in 2006. In the real estate graph below, the green bars show the number of arms length home sales each year, while the red bars show the number of distressed sales. The brown line is the measurement of the average sales price of a home sold in the Gardens of Killearn. Currently, the average value of a home in the Gardens of Killearn has dropped to just $107 per square foot of heated and cooled space, after reaching a high of $145 per square foot at the peak of the Tallahassee housing market in 2006. The blue line below shows the incredible run-up of home values in the Gardens of Killearn, and the subsequent drop that has returned values back to levels last seen in 2003. Unfortunately for homeowners, this means that if you want to sell a home in the Gardens of Killearn, you can expect lower prices and falling values for several more years. Home sellers must either decide to wait out the corrective market for at least five more years, or sell now and sell fast. With falling values, home sellers who test the market first end up yielding less money than those who sell right away. If you have enjoyed the Gardens Of Killearn Home Sales Report, you can follow this link to discover similar reports for other Tallahassee neighborhoods.